Stella's Musings: Unique Celebration of Lakshmi Puja in NE India! Its the full moon night. In the north east of India, where there is little air pollution, the moon is shinning like a huge silver plate. Below, amidst the moonlit paddy fields, people are celebrating Lakshmi Puja festival. 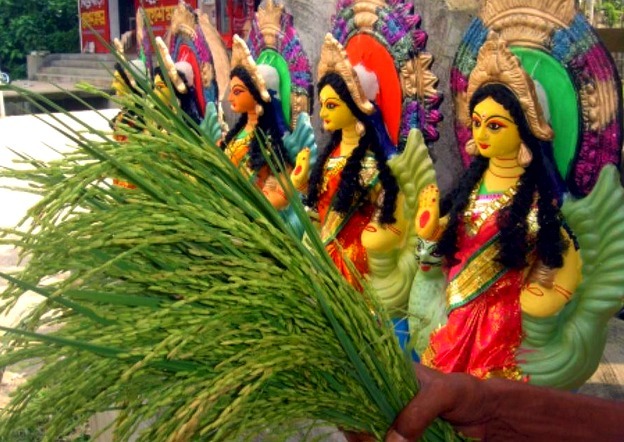 Essentially a peasant's festival, Lakshmi Poornima (poornima = full moon) is believed to be the night when goddess Lakshmi comes on earth and fills the paddy pods with 'life'. From tomorrow, if you press a pod, white milk will ooze out and in a couple of months, hardened into rice, will be ready for a harvest! To welcome the goddess, the peasant therefore will offer all he can: coconut sweets, fresh fruits, and rice cakes. He will even paint the steps of his house with rice powder. And once this is done, he will, quite inexplicably, indulge into something not so holy: stealing! Yes, tonight everyone will have to steal something from his/her neighbor's house. Its advised to steal a turmeric plant which symbolizes gold, but any other garden produce is also acceptable. Stealing anything from within the house is a strict no and if one indeed picks up something valuable, it must be returned next morning. Strange ritual, but it unleashes a lot of fun, as people often get 'caught' in the 'act' and break into loud laughter. And eventually it helps the neighbors bond, albeit in a funny way. Folk tradition, the best way to 'love thy neighbor'!